New Bergers restaurant is nearly complete near the M-84 and Three Mile Road intersection at the southern end of the new divided highway Frankenlust corridor leading to Saginaw. New Alice and Jack Wirt Library on Center at Jefferson is slated to open Tuesday. Bay City and Bay County are poised for high economic growth in 2006 with several public and private projects worth multi-millions of dollars ready to go or in final planning stages. The Bay County Growth Alliance will loan about $2 million tothe Great Lakes Foundation for an estimated $6.4 million Pere Marquette Depot renovation project, according to Cliff Van Dyke, Growth Alliance president. The City Commission is slated to consider the depot renovation project Feb. 21. Mortgagesto the city and the Growth Alliance on several downtown pieces of property will be used to secure the project, according to Van Dyke. The city has been asked by the National Park Service to insure that the historic integrity of the depot is maintained for 50 years. Fifth Third Bank is participating to the tune of about $4 million in federal New Markets tax credit purchases, said Mr. Van Dyke. The remainder of the project is financed by grants from Midland and local foundations and individuals and a federal T-21 transportation grant. "Charlie Curtiss has done a magnificent job putting this project together for the community through the Great Lakes Foundation," said Mr. Van Dyke. "I hope that all the pieces come together with the right timing and that there are no hitches." The depot is planned as the new home of the Bay Area Community Foundation and the Bay Area Convention and Visitors Bureau and a tourism information and tour bus staging center. Downtown revitalization will be further stimulated by a million dollar plus Waterfall Park gathering area at the foot of Third Street, jump started by the state's Cool Cities Initiative. The new Alice and Jack Wirt Library, centerpiece of the $20 millionlibrary expansion and renovation program approved by voters several years ago, is slated to open at 9 a.m. Tuesday, Feb. 14. The City of Bay City, while fearing possible loss of jobs at the General Motors Powertrain facility, is anticipating 200-300 new workers at the state's new DNR/DEQ office building in the Johnson Street industrial park. A projected 70,000 square foot office complex is being announced for bids by Joseph Chin of the state real estate division, according to Mayor Robert Katt. (See www.michigan.gov/dmb-red)Observers estimated the project by a private contractor, to be leased to the state, may cost up to $14 million. City Manager Robert Belleman has noted it will add to the city property tax base. Thelights are slated to brighten Columbus Avenue in an Ornamental Light Activation Ceremony sometime in March or April, according to Mayor Katt. The city has won a Michigan Department of Transportation grant of $152,000 for the $190,000 project, the city manager reports. City taxpayers and residents likely will be invited to decide through a series of public forums what services they are willing to pay for in a "Budgeting for Outcomes" process in response to the current fiscal crisis. A five-year financial forecast and budget review is on the city commission agenda for the finance and policy meeting Monday, Feb. 13, at 6:30 p.m. The Rehman Robson firm will review the city audit for the year ending June 30, 2005. Assistant city manager Steve Black is also slated to report on the history of loans and current funding availability of the city's P.O.W.E.R. Fund. Meanwhile, an explosion of growth is already underway in the Frankenlust Township corridor from M-84 and Three Mile Road to Saginaw where a divided four line highway is being installed. A new Berger's Restaurant is nearly completed at the northern end of the corridor and township planners report that about 200 units of new housing, including apartments, are on the drawing board for the corridor. The Metzler Development firm which reportedly decided against further expansion of its Cortland Farms condominiums in Monitor Township after running into red tape from government officials, is planning a new development in Frankenlust. The next phase of Cortland Farms condominium complex reportedly is slated for the intersection of Amelith and Mackinaw Roads. Bay Valley is said to be planning to add about 64 units and the Schauman firm is planning 82 units, including rentals, in the Brookside Subdivision along West Side Saginaw Road. The Bay Valley Resort Hotel is being "aggressively marketed," according to officials, and may be near a sale to a new owner. Bay Cast Technologies has applied to the city for an Industrial Facilities exemption certificate for installation of a $450,000 vertical boring mill. Patti Stowell of the city's economic development marketing department reports that the equipment is to be used to manufactureequipment for the oil refinery and oil field industries worldwide. A long-anticipated warehouse distribution center at Mackinaw and US-10 is still up in the air, apparently bogged down in Monitor red tape, despite urging by the Bay Area Chamber of Commerce and economic development officials regarding the importance of securing the project. 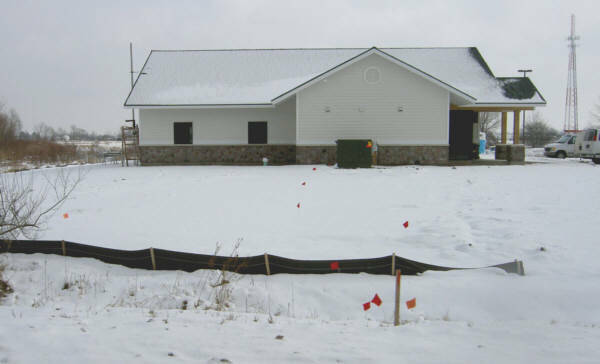 After experiencing delays by the Monitor Planning Commission, a Saginaw consulting firm pulled application documents from the township last weekand no announcement has been made about the fate of the project plan. The warehouse center has been estimated to cost between $10 million and $22 million and to provide 200 plus jobs if it proceeds.